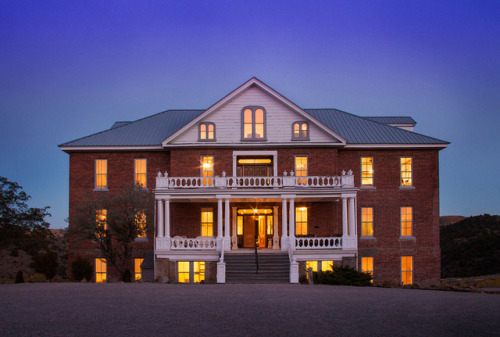 Constructed in 1864 as the St. #Mary #Louise #Hospital, St. #Mary’s #Art #Center in Virginia City, Nevada is said to be #haunted by the #spirit of a former #nun who worked as a #nurse, and whose #apparition is still seen performing rounds at night. In 1873, eleven #hospital #personnel were #killed after a hidden stash of #dynamite exploded in the basement. The #hospital was closed during the 1940’s, and reopened in 1954 as the St. #Mary’s #Art #Center. Employees at St. Mary’s have also reported encountering the #spirit of an #elderly #man in a wheelchair who allegedly died in a fire, as well as a former #nurse who died trying to save him. The evidence gathered March 23 did not disappoint and led many in the group of 30 […] to believe that the jail, built in 1882, is indeed haunted. Multiple voices from were captured during EVP circles, intelligently answering specific questions directed to former inmates. “Did you die here?” another investigator asked. “Yes,” uttered a different spirit. Continue reading at NWI Times.